I really think the black sets off the other colors! I wanted to give you a head up that I have a giveaway going on at my blog....free layer cake of your choosing...I'd love for you to come and visit! Love that binding idea ! It does look city quilt-ish. I like how the gray thread makes the quilting stand out just a bit from the black and other colors. A very, very nice quilt with a very excellent name. fair and square, lol, that's too cute. what a great name and design. one could do so much with that. Simple and stunning and what a clever boy to come up with that name! Well done! I love it. It's a great pattern. I made a quilt for my son in similar colors and I still really like it. Hey Amanda Jean, you were fabulous! I enjoyed meeting you and getting to know you. I love this quilt and am now trying how to quilt it. I think you need to put your doubts away. You were fantastic. I ended up leaving that thread on that machine! I knew I was going to do that. Remember that if you ever want a PA keep me on the short list and I am serious about that. Sometimes it is just fun to play a supporting role and to be a part of the fun! Nice to see a quilt that a man would appreciate. Well done! Sounds like you had a great weekend for a good cause. Mama Spark had a blast. Wish I had been able to go. Maybe next year. Thanks for the autographed pattern. I'll be making this quilt for sure. I like simple and fast. This turned out so gorgeous! I love how cozy it looks. What a great thing you're doing in making this and doing a talk at the charity party. Definitely City Quilt-ish but a crazy momma flair! Sometimes all the elements come together to make a simple yet great quilt--they certainly did with this one. Very City-Quilty, great choice of sashing color, quilting thread color and, definitely the name! Love this quilt! It's nice to see the dark background as well. I just started a quilt for my son and I'm going to use Kona Ash with it. That is a great quilt! I'm going to add this to my "must make" list - it looks perfect for some homespun plaids I just received, and also for fabrics where you want larger pieces to showcase a great print! Thanks so much for sharing!! Excellent name. Give him a high five. I love the quilt too. Very cool quilt - this design looks great. Glad to finally see that quilt. And to hear that the class went well. I love your phrase, 'very city quilt-ish'. Love your quilt, and yes, very city quilt-ish! I really like the quilt.. the pattern looks really simple and doable, yet like you said there's soo many possibilities. And I think while some quilts look too busy when they have pieced bindings, it works really well for this one. Great! I have a ziplock full of squares I cut from my boys' and husband's old shirts over the years. This inspires me to put them together in a similar quilt. I really like how it turned out. Great quilt! I love hearing about your design constraints and seeing the excellent result. Tell your son he gave it a great name too! 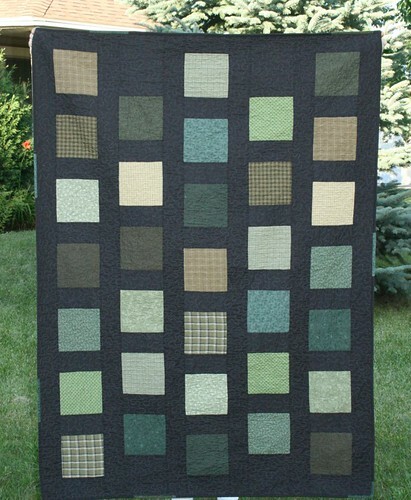 This quilt is perfect--I'd really like to make this for my son who is beginning college soon. What are the dimensions of your squares/strips? Thank you. Simple always looks so effective when the right colour-combi is put together - I love this and think it would be a great idea for a christmas prezzie for my dad - he's always cold (wears a hat indoors throughout summer!!!). What dimensions did you use??? Just love it, this is my kind of quilt, simple and modern. I love the tiny changes in colour on the binding, actually, I love it all! I love it! Good name too. Beautiful quilt, my husband has been bothering me for a "man quilt" lately. Nice idea with the dark colors, I will have to give that a try. I love, love this quilt. Any chance you will do a tutorial for it here? I wish I were close enough to attend one of your classes some time! I like that you quilted it in grey. It gives the black sort of a variegated look and lightens it up just a little. I have a ton of older dark greens that aren't really in style anymore. I've been wondering what I should do with them. I like the black -- and I never like black sashing very much (although I did recently buy a whole bolt of it for a quilt my daughter is doing). Love this quilt!! I have been wanting to do something similar for my son. Will you share this pattern with us?? You've inspired me to use some of those hunter greens that don't go with anything now. LOL! Love them with the black. Great quilt and it is very City Quilt-ish! *grin* I knew this post was coming! I loved meeting you on Saturday.....and I'm excited to try this quilt in something girly now. I have quite a few plaids and madras prints in pinks, oranges, and blues ---- reclaimed from PJ pants, button down shirts, and, of all things, a couple house dresses I picked up at The Salvation Army. I'm sashing in white and will be making quilts for the bunkbeds in our little camper. you succeeded in creating a masculine quilt that looks fairly easy to make!! Great job. That grey thread really gives the black fabric some great texture!! Great quilt with a great name. Congratulations to you and your son. I'm not usually a green fan, but you made them look great, and I love the plaids mixed in. Very Cool CrazyMom! That black almost looks like a dark gray from here -- I thought maybe you'd joined the gray craze! Your son did a great job naming this quilt! - and the black looks great! And you did a great job "being in front of people" this weekend. Better you than me. haha! thank you SO much for a lovely weekend! I enjoyed meeting you and working on these quilts with you! Don't second guess yourself for one minute...you were great! Amanda, this is a great quilt! It sounds perfect for Margaret's Hope Chest. I'll bet the Summer Work Party was a lot of fun. Wish I could have been there. It's great to see an interesting yet manish quilt!!! Kudos to your son for coming up with the name!!! wonderful quilt!!! you are an awesome teacher! Your son came up with a great name! I think you met all the goals and then some with this quilt Amanda! It's wonderful and I can't think of any guy who wouldn't love it! Great quilt - it does have that "city" feel. Your son should hire out his naming talet - that's a terrific name! Okay, now you know that your fans are going to be clamoring for a tutorial. May I be the first to clamor?